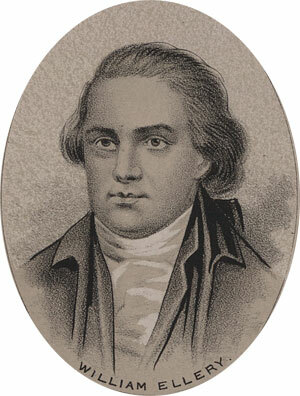 William Ellery was born at Newport, Rhode Island, in December of 1727. Under the tutelage of his Prominent father, Benjamin Ellery, he attended Harvard College and graduated at the age of 15. He searched for the right career for many years, worked as merchant, then a collector of customs, and later as the Clerk of the Rhode Island General Assembly. He began to practice law in 1770 at the age of 43, that he seemed to find his calling. He was active in the Rhode Island Sons of Liberty, and was sent to the Continental Congress in 1776 to replace Samuel Ward, who had died. He was immediately appointed to the Marine committee and later participated in several others including the committee for foreign relations. Meanwhile he held the office of judge of the Supreme Court of Rhode Island. In 1785 he became a strong and vocal advocate for the abolition of slavery. He was appointed First (customs) Collector of the port of Newport, under the provisions of the Federal Constitution, where he served until his death in February of 1820.